Ah yes, "the Chicago episode." Has a more divisive single episode ever aired in a hit TV show? When Stranger Things 2 came out, we were all enthralled by the new threats, alliances, character arcs (we're looking at you, Steve), and conflicts. But then, right in the midst of the mounting drama in Hawkins...BOOM! We're in Chicago. And some fans were just not into that plan. Your girl, however, feels differently about it. The Chicago Episode really showed her new reaches of Eleven's character. The episode was a little spooky and kept her on the edge of her seat. And it showed El that she belongs in Hawkins with her friends—that she is human with a big heart, even amidst all of her superhuman powers. 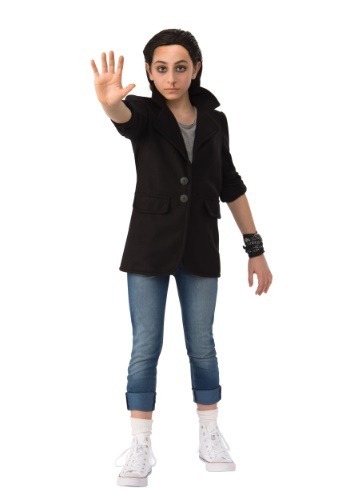 So, help your girl show her affinity for this controversial plotline with this Stranger Things Eleven Punk Costume for Girls. It's a little dark, a little mischievous, and a little different...but it's still 100% Eleven! This look is classic 80s punk and will instantly make your child recognizable as everyone's favorite bad girl (for an episode, at least)! It includes a replica black jacket and punkish wrist wrap that look just like the ones Kali and her crew use in Eleven's warehouse makeover. We're even throwing in the slicked-back wig, which is great, because your kid isn't really into dying her hair dark or cutting it to a length that works for this look. Pair these items with dingy denim, El's signature high-top sneakers, and some well-applied smoky makeup and your gal will look one part thieving bandit, one part lost little telekinetic girl with a whole lot of heart. Make sure your girl is ready for this—dressed in this punk ensemble, she's bound to get into a LOT of heated conversations about the Chicago episode. So have her brush up on her best reasons for loving this story twist—or not. Eleven doesn't answer to anyone!